1 PMS color printed on Side 1 of uncoated 80lb Granite Felt stock. The cool color of Granite Felt stock gives the same impression of sturdiness, calm, and permanence as the stone for which it's named. 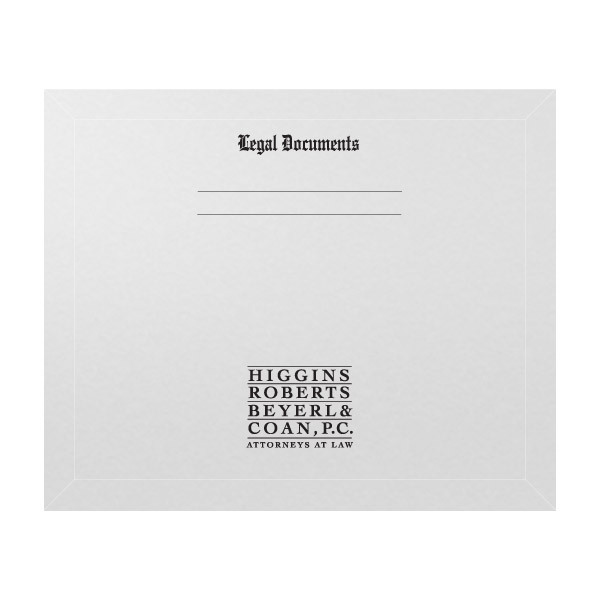 Black ink sets a no-nonsense tone for attorneys Higgins, Roberts, Beyerl, and Coan, while a display font reading "Legal Documents" lends a slightly medieval look to the design. Two blank spaces let the attorneys customize each client's documents to avoid any mix-ups. Full 9" x 12" folders or thick presentation packets fit easily into the extra-large pocket. Conformer® expansion scores allow the pocket to accommodate print media up to 1" thick, without bulging or tearing. Two tuck tabs seal the flap shut to keep documents safe and sound in the single large pocket. Its landscape orientation makes this product easy to store in a drawer or filing cabinet and offers a wide design canvas for custom photography, text, and brand elements. Dimension Closed: 12 3/4" x 10 1/2"
Dimension Open: 12 3/4" x 13 1/2"
Acceptable Insert Sizes: 12" x 9"